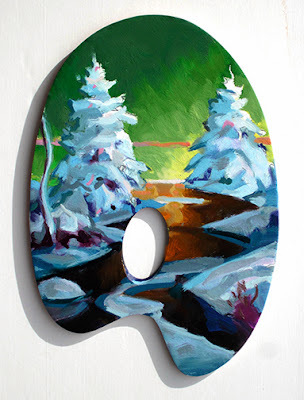 Florence Griswold Museum in Old Lyme, Connecticut has an innovative way of celebrating the holidays- Christmas trees decorated with artist's palettes. As a gesture toward their own history of artists painting panels for the Museum, they ask artists to paint on wooden palettes. I was invited by David Rau, Griswold's Director of Education, and Outreach to try my hand at one on one of their palettes. The Museum hangs them on Christmas trees inside their galleries. This is the 10th anniversary of "Miss Florence's Artist Tree." Christmas decorations had a hand in turning me toward painting in the first place. At six I became something of an art critic. A 1914 watercolor by Edward Hopper. As I was out this morning I was struck at the remarkable complexity of what we usually see in the world. Honestly it's a bit overwhelming to the eye, which is why we wear mental blinders most of the time. Artists give us energy by creating an "alternative universe" that is quietly simpler than reality. When it's done right, viewers are too busy drinking in a painting's energy to notice. 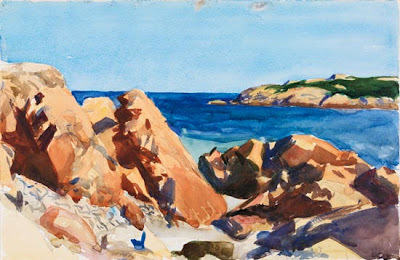 In the watercolor above for example, Hopper paints what in real life was a maddeningly busy rocky foreground. He radically edits out much of the detail (the bleached-out immediate foreground). He prunes it down, adding a powerful wind to the painting's sails. My own painting above also delivers a simpler reality. Its focus is the contrast of the vertical stripped-bare tree trunks against the rest of the painting. Philip Koch, The Song of All Days, oil on panel, 36 x 72". The most powerful paintings can speak quietly. They must be subtle enough that you want to live with them for years- drinking in what you can when you can or ignoring them when you must turn to other things. If paintings came on with all the clamour of a rock star they might gather crowds quickly but over time the crowds would drift away. 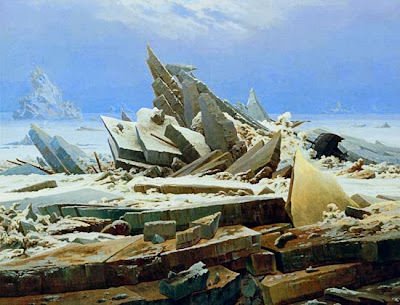 Instead the best paintings call for your attention quietly. Heck, they only whisper. Yet their power plays out into your life for a long, long time. Every year I have a wall calendar of Edward Hopper (Am. 1882-1967) paintings. Guess which Hopper I was enjoying all of October. Now it's November and I miss it. This is the very first watercolor by Hopper I saw in the flesh. It was 1972, the final year of my MFA Painting Program at Indiana University. Wichita State University had invited me to fly to Kansas for a teaching job interview. During a break in the interview process some of the faculty took me over to visit the Wichita Art Museum. 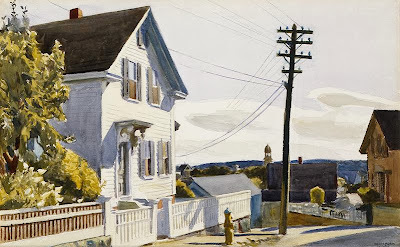 My favorite piece was Hopper's Adam's House, a view of Gloucester, MA painted in 1928. It's remarkably crisp and fresh.